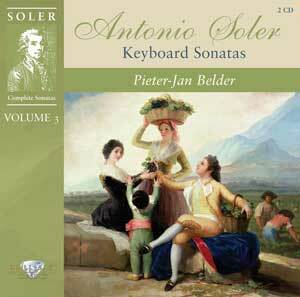 I love the keyboard music of Antonio Soler. It is clear that Peiter-Jan Belder does to, although I suspect for different reasons. To me, Soler was the liberator of the keyboard player's left hand, underpinning his textures with some really heavy bass and making the most of the bottom end of the harpsichord keyboard. When played on the piano, the performer can really emphasise this aspect of the music, laying into the repeated pedals in the bass and taking the textures almost into the realms of industrial minimalism. That option isn't open to the harpsichordist, but I don't think Belder would indulge in that sort of thing even if he could. His Soler is closer to Scarlatti, it is melodically driven, decorated only with simple ornaments, and above all structurally focussed. Soler has been in the harpsichord, organ and piano repertoire since the early part of the 20th century, and performance practice of his music has kept up with all the various fashions and trends in the presentation of 18th century music. Belder is careful to balance the baroque and Enlightenment sensibilities of this music, adding shades of rubato at structurally significant cadences, for example, but never straying too far from the rigid tempos that characterise performances of music of earlier generations. The harpsichord sound is wonderful. The instrument was made in 2003 by Cornelius Bom. It has a clean, precise sound, but is never feels underpowered. The liner does not mention the temperament or pitch used, but it sounds quite modern. Not too jarring in other words, so ancient and modern meet in the combination of archaic timbre and more modern pitching. The sound quality is very good too, a very immediate sound from the harpsichord, and with plenty of that essential Soler bass. The liner contains an essay by Frederick Martin, the scholar responsible for popularising Soler in the years after the war. By the sounds of things, we are very lucky to have this music at all. No original manuscripts of Soler's keyboard survive. The monastery in Monserrat where he spent a great deal of his life turned out to be the most useful source of manuscripts, all in other hands. In fact the number of nationalities involved in transmitting Soler's music to the modern world is astonishing. The composer himself was Catalan, his first editor of modern times was the Cuban composer Joaquin Nin, Frederick Marvin is American, and now here we have a recording of the music from Holland. The order and numbering of the sonatas in the recording follows the Rubio edition (the work of a Spanish scholar). Dating the works is close to impossible, so the order can be treated as more or less arbitrary. On the other hand, the numerical approach shows a loyalty to the principal of a complete recording cycle. There isn't much variety between the pieces, and to be honest two discs is quite a heavy dose. This is probably a candidate for taking half a dozen tracks and adding them into your iPod playlist. It is good to see the Brilliant Classics label branching out from their core reissue activities. The number and range of discs they have put on the market – at bargain price – over the last couple of months suggests that they plan to be one of the more optimistic and energetic labels in the classical music market of the future, whatever that looks like. If this recording is anything to go by, they could well be onto a good thing. Heaven knows how they make a profit out of this sort of a release, but here's hoping they do, and that they continue serving classical music's various niche markets to this high standard.